Did you know that dinosaurs used to roam Scotland? Recent discoveries of 150-million year-old fossil footprints near Inverness have shown that dinosaurs literally lived in our back gardens! Follow the footprints throughout the museum from those earliest fossils, which gave rise to dinosaurs as we know them, to the most recent and exciting dinosaur discoveries from the UK. The first dinosaurs ever recognised and named by scientists were discovered here and the very word ‘dinosaur’ is British. Over a hundred species of dinosaur are found in the UK and some very important finds continue to be discovered in the Highlands – right on our doorstep. From 24th November to 2nd February, Inverness Museum and Art Gallery will be hosting an exhibition of Scottish and other British dinosaurs. Come and meet the monsters that called this area home 150 million years ago; see and touch real fossils, find out what they ate and why they died out. 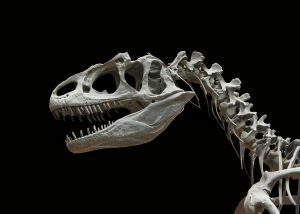 Stand beside dinosaur skeletons, touch dinosaur bones and see stunning original fossils found around the British Isles – from teeth to tail bones, jaws and claws, food to fossilised poo. This collection of dinosaurs has been carefully selected to show everything from the diet of the dinosaurs to their behaviour. There is also a very special example of the kind of meteorite which might have finally destroyed them! Special exhibits will explore other prehistoric creatures living at the same time as the dinosaurs. But dinosaurs aren’t completely extinct – see examples of some that are still alive and well and living in Britain today. Is a prehistoric creature still alive in Loch Ness? Will you make the next big dinosaur discovery?